A TrendSource poll shows people's perception of the future political climate influences their likelihood to make big-ticket purchases. “This data suggests that intentions to purchase big ticket items may be more influenced by fears of political instability than economic concerns,” concluded TrendSource's Senior Analytics Manager, Brian Harward. TrendSource surveyed 1,971 respondents between June 7 and 14 to try to better understand the relationship between individuals' perception of the political and economic climate and their willingness to make a big ticket purchase. We found there is a direct relationship between people's forecast of the political future and their purchase behavior. 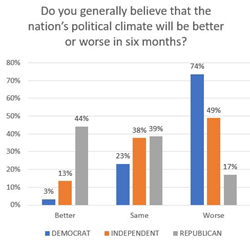 Individuals who believe the political landscape will be worse in 6 months are 79.5% less likely to make a big-ticket purchase than individuals who believe it will get better. Furthermore, increased conservatism among respondents was directly correlated with higher ratings of the current and future political and economic climates. “This data suggests that intentions to purchase big ticket items may be more influenced by fears of political instability than economic concerns,” concluded TrendSource's Senior Analytics Manager, Brian Harward. He continued, "So much goes into influencing whether people think politics will get better or worse, but fascinatingly that perception also can shape purchasing behavior." The survey speaks to some of those influences. For example, when segmenting respondents into those who racially identify as white and non white, we see some interesting rends. A staggering 64% of nonwhite respondents believed the political and economic future would be worse than today; roughly 1/3 less, only 41%, of white respondents felt the same. Furthermore, money begets optimism. We broke household income into seven $25,000 buckets starting from less than $25,000 all the way to more than $150,000; not only were the wealthiest among the most optimistic about the nations' economic future, they were also far likelier to make big ticket purchases. In fact, every increase in $25,000 of annual household income made that household 23.5% more likely to make a big ticket purchase. Read our blog on the study's most significant findings and check out the raw data.